Finally starting to play with my pixy2 cam for lego I have a display issue with all the related blocks. 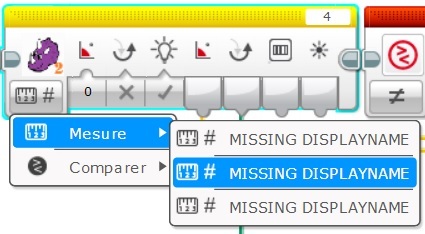 Actually every information pop-up I get when mousing over an item only give me a “MISSING DISPLAYNAME”. Both my brick and my softwares are up to date (I tried with educational and home version as well). Any help with that please ? I think that may be a language support issue with the Pixy2 block… I will investigate! But that would be strange, isn’t english the native language ? I’m having the same problem. Working on Windows 10, Mindstorms Education version 1.4.2 Dutch. The block names were incorrect. I have a fix to try. I’ll get it into the repo shortly. Here is a new version with different language options enabled. Can someone give it a try and let us know what you find? thanks! Also for me still the same issue (Dutch). Sorry about that – we’ll get back with another version to try soon. Please give this version a try. Be sure to restart the LEGO IDE after updating the Pixy2 blocks. Yes , this version (2.0.8) works fine for me, although text is not in Dutch yet. That’s good, thanks. We haven’t localized the blocks, unfortunately.